Each of the four honorees received a $2,000 cash award from Michelle Hopkins-Molinaro, vice president and managing director of the foundation. With today’s awards, the Hopkins Foundation has given nearly $700,000 to teachers and support staff members in the Emporia schools since the inception of the awards. The awards program was a dream of Molinaro’s grandfather, E.L. Hopkins, as a way to reward educators. She fills in as “grandma” for students at school events, arrives early to have breakfast with students needing some extra attention, and always donates her time and talent to school projects. “She is one of those people who goes above and beyond on a daily basis,” one nominator wrote. 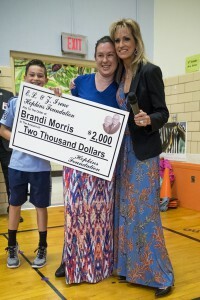 Brandi Morris is known at W.A. White Elementary as a dependable and positive team player. “Brandi is a terrific team player. She works closely with any staff she comes into contact with. She is a leader in the classroom, lunchroom, and playground,” a nominator wrote. 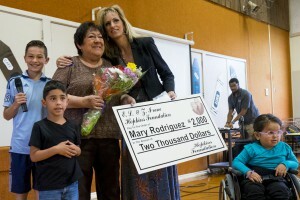 Mary Rodriguez, secretary at Maynard Early Childhood Center, is described as a caring person who always has a smile on her face. “Mary has been an integral part of the Maynard Early Childhood Center for many years. She has been the secretary at that building for a long time serving USD253 and ECKAN as the secretary of the Head Start program for many years,” one nominator wrote. Kelly Olson is a life skills teacher at Riverside Elementary, where she has taught many years, serving students with multiple disabilities. She is known as a strong advocate for her students and as a school leader among her co-workers. She is seen as a positive image for the school. “She is so very passionate about serving this special population of our school. It’s people like her that make Riverside an awesome place for our kids and families and staff.